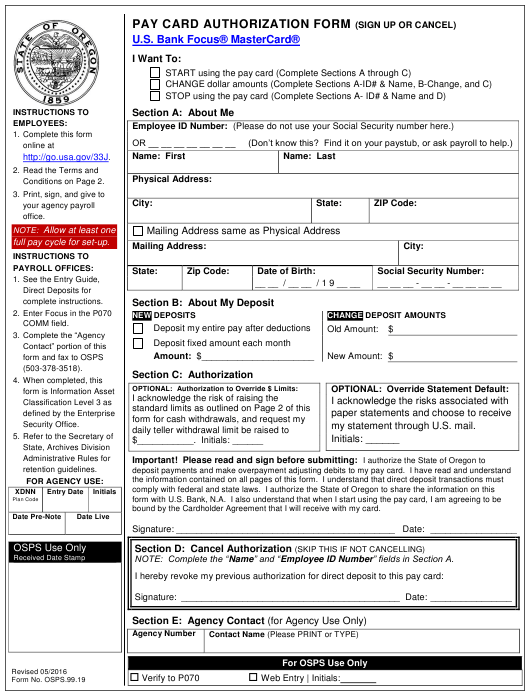 Form OSPS.99.19 or the "Pay Card Authorization Form" is a form issued by the Oregon Department of Administrative Services. The form was last revised in May 1, 2016 and is available for digital filing. Download an up-to-date fillable Form OSPS.99.19 in PDF-format down below or look it up on the Oregon Department of Administrative Services Forms website. full pay cycle for set-up. my statement through U.S. mail. bound by the Cardholder Agreement that I will receive with my card. NOTE: Complete the “Name” and “Employee ID Number” fields in Section A. Not assessed if balance is $0.00. beneath Section B. OSPS will request an exception for your card. Unless you request a paper form, you will receive an electronic statement through a secure website. The website address will come with your card. information to verify your identity. They will not share it with other entities. See their privacy information below.